I was super happy when I found this one in my collection after reading that Emily's Happy Chemo quilts will be going to the Rat Pack organization. Their main focus is helping those fight breast cancer and our Quilty Hugs will be going into their Love Handle Bags. special for a Love Handle Bag don't ya think. 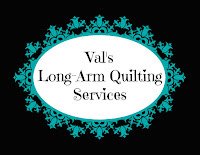 I'll have more time in the studio and would love to quilt for you! I specialize in edge to edge/pantograph designs with an extensive collection to choose from. May through July I'm offering free returning shipping on all quilts and only charge .018 cents per square inch. Contact me for your Summer quilting needs. I'd love to quilt for you. Click the picture below for more details. We hope your week has been filled with a little bit of fun, relaxation and happy sewing. Linking up with many of the blog parties on my Linky Party Page. 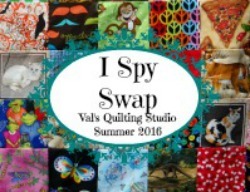 PS: I-Spy Swap coming this summer here at Val's Quilting Studio!! I love your H2H quilt! That panto is perfect! Beautiful H2H. I love the quilting. This quilt will be loved and treasured. Looking good, wonderful panto for that project. Jackson is just too cute today! What a perfect panto. Great job! That is the perfect panto for the Happy Chemo quilt. LOVE that quilting pattern! Where did you find it? What a beautiful Quilt !!! 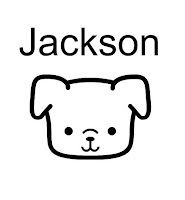 Jackson is so lovely ! Thank you for sharing your pics, Val ! This motif is indeed perfect, Val. I just love how it looks on the back. It's lovely on the front too! I wish you good luck in your new enterprise. That is a great panto. I think I recognized a butterfly in your quilt. How fun! That panto is just perfect. Great job! Val, your I Spy quilt will make someone really thrilled! The panto is great. I love those photos of Jackson! It will certainly be cherished by whoever receives it. I would love you and Jackson to quilt some of my quilts this summer! I am going to work on my Valentine's quilt this week--that will be a great one to send to you! Will you quilt with a minkee backing? I have another lap quilt that I need to make and it's going to have minkee on the back. I see your Jackson is hamming it up again....he is very sweet! Your eye spy quilt is fabulous...love the quilting design. This is a great finish Val, and good call on the soft flannel backing. I'm hoping to drop my two H2H quilts off later this week. Absolutely love seeing Jackson in the pics; bet he'll be glad to have his mommy home all DAY soon! Perfect quilting! And that Jackson is a riot! The quilting is perfect! It's a very fun quilt.